Mumbai, June 14 2017: Godrej Appliances, one of India's leading players in the home appliances segment, has unveiled its Godrej Edge Pro range of inverter compressor direct cool refrigerators. This new range of refrigerators, which consumes just 122 units of power annually, will help customers save Rs 6580 more than 3- star refrigerators over a period of 10 years, making it the most energy-efficient refrigerator in its segment. It can even run on extremely low voltage, allowing it to operate on power generated by home inverters. The technology promises to save up to 18 million units of energy compared to other three-star models till the year 2019. 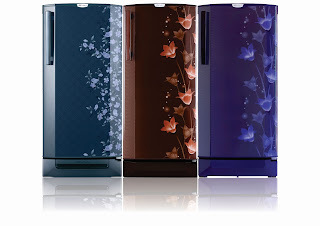 Moreover, it incorporates Godrej's unique Staycool technology which keeps the freezer cool for up to 24 hours after a power cut and comes in a range of vibrant colours. Direct Cool category forms 78 % market of entire refrigerators market. Godrej aims to increase its share from 13 % to 15 % through this launch. This new range has been launched in exciting new colors of wine, blue and brown, and is priced at Rs 18690 onwards. To make it even more delightful for consumers, the company had recently increased the compressor warranty on all their models above 190L direct cool models to 10 years. This product will be available across all channels and leading stores and is backed by a robust Godrej Smartcare service promise. Godrej Smartcare offers the widest service network with 625 service centres and more than 4500 Smartbuddy technicians, 24x7 call centre in 10 regional languages, Smartmobile vans for enhanced reach and faster service and CSN (Complete Satisfaction Number) which enables the customer to rate the service offered through a unique code. Godrej Appliances is one of the largest players in the Home Appliances space in India and has always delighted the consumer with relevant technology across a wide range of products. In 1958, Godrej was the First Indian Company to manufacture Refrigerators and has now become synonymous with the category. The company is known for delighting the consumer with innovative, relevant and green technologies. Godrej has created many milestones in the Indian appliance space – be it in the environment/energy efficiency space, including the launch of the first green AC in the world (2012), launch of the first green refrigerator in India (2001), launch of the first 5 star range of refrigerators (2008), launch of the first inverter AC in India (2005), the first refrigerator with 6 Star Performance(2012) or a pure consumer delight space like the launch of the music refrigerator, DAC (Dynamic Aqua Power Control) Technology, Tilt drum and U-Sonic technology in washing machine or Steam Microwave Ovens and Pizza/Kebab makers in Microwave Ovens. In recognition for its efforts, the brand has been conferred with many prestigious awards and honors such as the Consumer Superbrand Award (2013-14, 2011-12,), ‘Voice of Consumer’ Award by Frost and Sullivan (2014, 2013), Reader's Digest Trusted Brand- Gold (2015, 13, 12, 10, 09, 08, 07, 06), Business Superbrand (2011,10,08), ET Best Brands (2013-14), ET Promising Brand (2014-15); Consumer Superbrand (2009-10), ‘Most Innovative Company’ by Business Standard (2010), India Design Mark award for Green Balance ACs, Glitz Washing Machines and Edge Digi Refrigerator (2015,14,13), National Energy Conservation Award by Govt. of India, Ministry of Power, BEE (2015, 14, 09), Good Design Award by Japan Institute of Design Promotion for Edge Digi Refrigerator (2015) and many more. Both the manufacturing units of Godrej Appliances’ - in Shirwal and Mohali became the first and only manufacturing units in the country to be honored with the coveted Platinum Green Co certification for their efforts in green manufacturing. Godrej’s focus on balancing consumer needs with the environmental cause has enabled the organization to redefine the technology landscape in the appliances industry – to the delight of both the consumer and the environment.